What is black garlic? Have you heard of it? Not sure how to describe black garlic adequately. 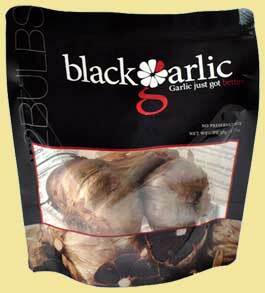 To start with, as it says on the label, it is black but that is not because it is a different variety of garlic. It is the normal garlic which has gone through a process that has transformed it in flavour, colour and texture. A lot of what I have read says it has a balsamic like flavour to it but I feel, and everyone's tastes are different, it is more akin to slowly braised onions that have slightly burnt but with a light garlic taste rather than an onion taste! Probably a lot to do with its sweetness. Certainly pleasant enough to pop one in your mouth and eat it like a sweet. As for the colour it makes you think of liquorice - a very black black - and you could eat it as it if it was a sweet if you wanted to. If you try one this way you will find the texture is very much like eating a liquorice sweet or chewing a wine gum (might be an interesting trick to play on someone). 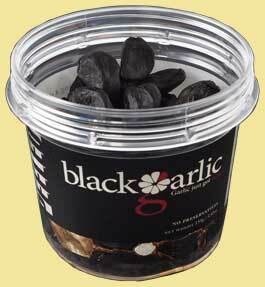 Black garlic is sweet meets savoury, a perfect mix of molasses-like richness and tangy garlic undertones. It has a tender, almost jelly-like texture with a melt-in-your-mouth consistency similar to a soft dried fruit. This is how the producers describe it which is pretty much how I found it to be. I have used it a few times in cooking. The Black Garlic comes as the complete bulb or as ready peeled cloves. The first time I used the already peeled cloves. I made the mistake of trying to chop them up . . . it just stuck to my knife so in the end I threw them in whole and left them to dissolve in what I was cooking. I forget what I cooked but the flavour from the Black Garlic did not come through enough to give me a good impression. Perhaps I just did not use enough. I am not sure I have really used it to best effect yet but I did have a little success with some of these cheese recipes such as cauliflower cheese (see recipe below) in which it definitely added to the flavor (sauce was a bit brownish but that could have been because of my mushrooms). Would I recommend it? I am not sure but I would certainly recommend trying it and making your own judgement. I think it might go well in a simple risotto but I have not had the time or the occasion to cook one yet. For me there is one big negative to Black Garlic. On the web site it says Imagine garlic without all of the annoying stuff. Bad breath? Nope. Pungent odour? Nope. The odour of garlic cooking is one of the great food smells of the world so to remove that is a shame but then this is not garlic as you know it. It is a completely different food. Try it and you will see what I mean. If using a steamer put it on to warm up otherwise bring water to the boil ready for the cauliflower. Cut bacon into small pieces and fry in high sided pan until it starts to crisp. De-seed chilli and finely chop. Add to pan. Add the garlic cloves to the pan and break up in thee pan as they start to cook. Start the cauliflower cooking as it will need around 15 minutes. Add the sliced mushrooms to the pan and stir. Cook until mushroom slices start to go limp. When the crème fraiche starts to bubble add your cheese and keep stirring until cheese has all melted. Keep warm until cauliflower is cooked. Place cauliflower in a large bowl and cover with cheese sauce. Serve on its own or with a meat of your choice. If you want further information you can find this on the Black Garlic web site. It is that time of year again when the veg section in your local supermarket will have a large pile of pumpkins on display ready for Halloween. 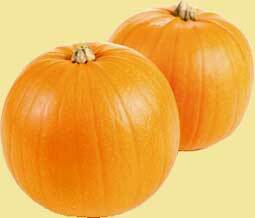 If you are scooping one out to make a Halloween lamp why not put the pulp to good use, rather than wasting it, by making a Pumpkin Pie. Preheat the oven to 170°C / Gas mark 3. Whisk together the egg, cream, sugars and spices. In small amounts at a time, thoroughly whisk in the pumpkin puree. Warm the pastry case in the oven until it is hot to the touch. Pour the pumpkin mixture into the pastry case. Bake until the centre of the filling is set which will take approximately 35 to 45 minutes. Leave cool completely on a rack and then refrigerate for up to one day. Serve the pumpkin pie chilled or at room temperature with generous helpings of whipped cream. 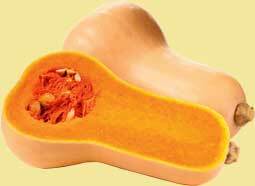 Using a vegetable peeler remove the hard skin from the squash. Chop your onion and squash into small pieces. Open the tin of tomatoes. Add olive oil to the saucepan. Add onion and squash and cook gently until they soften without going brown. Add the stock and tomatoes. Allow to simmer until it becomes thicker. Add cinnamon, pepper and basil to your taste. Blend the soup using a food blender. Serve hot with a slice of whole meal bread. Cream together the sugar and the lard. Mix in the flour, treacle, mixed spice and ginger and the dried fruit. Add the bicarbonate dissolved in milk and mix together. Put the mixture into a greased tin and bake in oven for about three-quarters of an hour. Cut in half, spread with butter and eat hot. 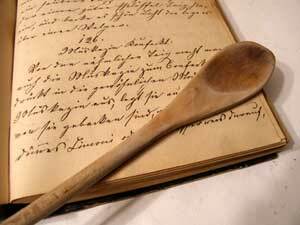 Baking powder is one part baking soda (bicarbonate of soda) to two parts cream of tartare (tartaric acid). 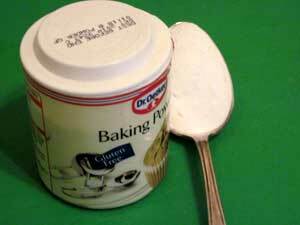 The very thing that makes baking powder work also makes it unstable and gives it a short shelf life. Eventually the two chemicals cancel each other out. When this happens the baking powder is dead and anything made when using it will not rise. Purchasing baking soda and cream of tartare separately and making your own baking powder is a good way of increasing the shelf life and always ensures you have a good, workable baking powder otherwise you will have to use it frequently before its shelf life expires. By making your own you can make smaller quantities than you can buy from the supermarket.